A game of who's hunting who? What happens when the hunter becomes the hunted? In Tally Ho one player takes the role of the hunters and the lumberjacks; the other takes the role of the foxes and bears. 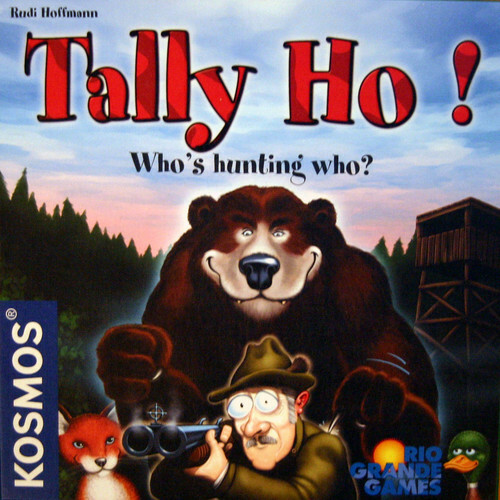 Both players hunt each other. At first, the forest lies peacefully under the face down tiles. As the tiles get flipped over and moved around the board, the forest awakens and the hunt destroys the serenity of the forest. The lumberjacks cut down and remove trees to open swaths through the forest to provide hunting fields for the hunters. The bears then use these same aisles to track the hunters and the lumberjacks. Unfortunately for the ducks and pheasants they can be caught and eaten by the foxes or caught in the cross hairs of the hunter. The two sides are balanced with luck dominating the early game, but skill taking over at the end. Good hunting! Game Profile: Oh Gnome You Don't! Game Profile: Risk 2210 A.D.
Game Profile: Trailer Park Wars!